The morning session belonged to the hosts. The New Zealand bowlers – Neil Wagner in particular – bowled a disciplined line and length to keep scoring to a minimum. The fielders held their catches and ultimately the Proteas finished the session having scored 72 runs for the loss of four wickets. The South African-born Wagner starred on day one, claiming the prize scalps of Hashim Amla and JP Duminy. Kane Williamson backed the left-arm seamer for an extended spell early on day two, and one fierce short delivery led to the dismissal of Elgar. BJ Watling dropped Elgar in the second over after lunch on day one when the South African opener was on 36. On this occasion, Whatling held the catch and Elgar’s fighting knock – 140 off 299 balls – came to an end. Whatling’s initial blunder cost the Kiwis 104 runs. Elgar never looked comfortable in the period leading up to his dismissal. He did enough to achieve his highest score in Test cricket, though, surpassing a previous best of 129. New Zealand heaped the pressure on Quinton de Kock, and reaped a significant reward when the dangerous left-handed batsman lashed out at a Jeetan Patel delivery and was caught by Wagner on the offside. At 265-6, the Proteas were starting to wobble. 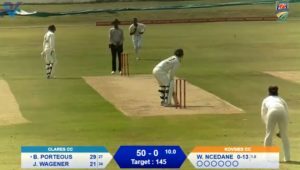 Bavuma had shown good composure to reach 50 off 143 balls; his first half-century since the 74 he scored against Australia in Hobart in November 2016. He gave his wicket away, however, when he attempted to give himself room and edged the ball to Watling down the leg side. Keshav Maharaj played a rash shot shortly before lunch and offered up a simple catch to Jimmy Neesham. Vernon Philander and Kagiso Rabada managed to survive the period before the break. When the Proteas resumed on day two, they may have felt that a total of 400 or even 450 was within their reach. But after a disappointing morning session, the visitors will need to readjust their goals. At this point, they would do well to post 350.